This has been a good resting week, I have felt good, but a little more fatigued than usual. It could be due to the build up since there are only three more chemos……or it could be because the weather is rainy here, which is very unusual in Arizona. A little more hair has disappeared, but I still have enough to comb forward to have bangs with my hats. The chemo tan is getting darker, wonder how long it will last after chemo is over? The elk is being redone on the black media board. I am liking it better so far. Didn’t get out the good camera, but will next time! SO the camera phone is Ok, but does not do justice to the colors. I didn’t get as much done this week as I would have liked….maybe it is because friends have been taking me out to eat this week, LOL. Mary, Delia and Tom, Thanks so much! It was so wonderful seeing you all and getting out of the house for a while! The birds and cats are all napping in this wet cold rainy weather, I think I will grab a book and curl up with a nice fuzzy blanket and so the same. Feel free to join us! Whooo Hoooo 9 chemos down and only 3 to go!!! The nurses gave me a copy of my blood-work from Monday, and the chemo markers in the blood-work are down to 51! That is down from 75 just two weeks before.The final number should be under 10, so we are getting there!!!! I slept pretty much from Monday until Thursday this week and woke up Friday with some energy! Not as much nausea this week. Thank all of you for the prayers, positive thoughts and good wishes! 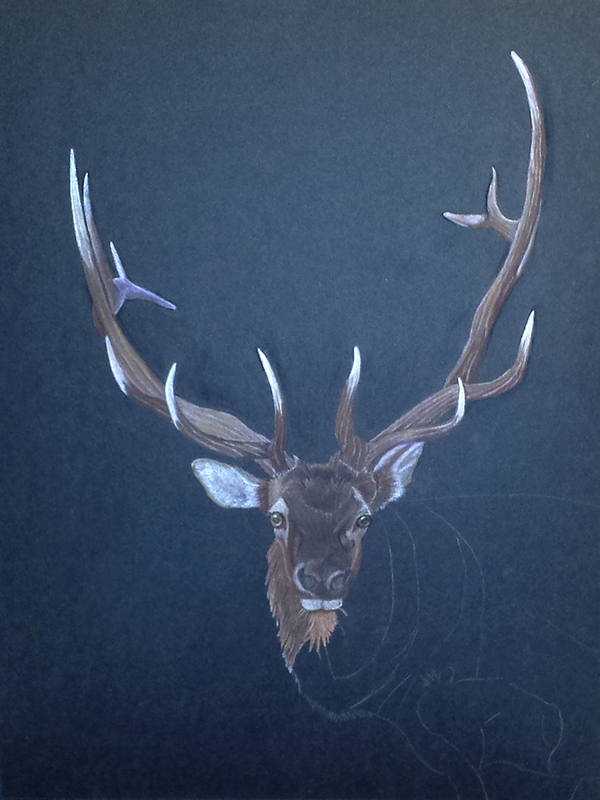 Here is the elk almost done. After the black backgrounds, it seems dull, so I am going to redo him on the black multi media board. That is the nice thing about this time of experimentation, I can try different things without the worry of how they turn out. So another silver lining with the cancer. Am still loving the pastel pencils, need to do a painting soon before I forget how to do watercolor though! Tomorrow is the closing of the Sahuaro Ranch show, so we will go pick up the drawing that did not sell, a couple of ribbons and a check. Very exciting! Tonight is the auction for Triple time Blues at the Houston Parrot festival Banquet. Good Luck Laney, hope the painting gets a nice contribution for the Bird Endowment! OK, i am really getting paranoid….the parrots and the kitties have been really good this week….so I know they are plotting something. Am not sure just what though. Will be keeping a VERY close eye on them this coming week…I hear Loki whispering, see something is up. Oh Hi Loki! What? Nothing, I was just blogging…No I was not talking about you…you want a nut…..Ok. Gotta go get the bird a nut, TTYL. Oncologist appointment was Friday, where we got some great news! The tumor markers in the blood-work are down to 75 from 225 last month! Four treatments to go and we want the count under ten, so we are making great progress. The original count back in September at diagnosis was 2000. Hubby, George and I were both ecstatic to say the least. Take that cancer!!!! POW!!! Saturday, I was feeling well enough to attend daughter Melissa’s play, “39 Steps”, at Mesa Encore Theatre. Friends Noelle, Margaret, Leo, Paul, and Josh met us there. The play great. We were all proud of Melissa and laughed so hard our stomachs hurt. 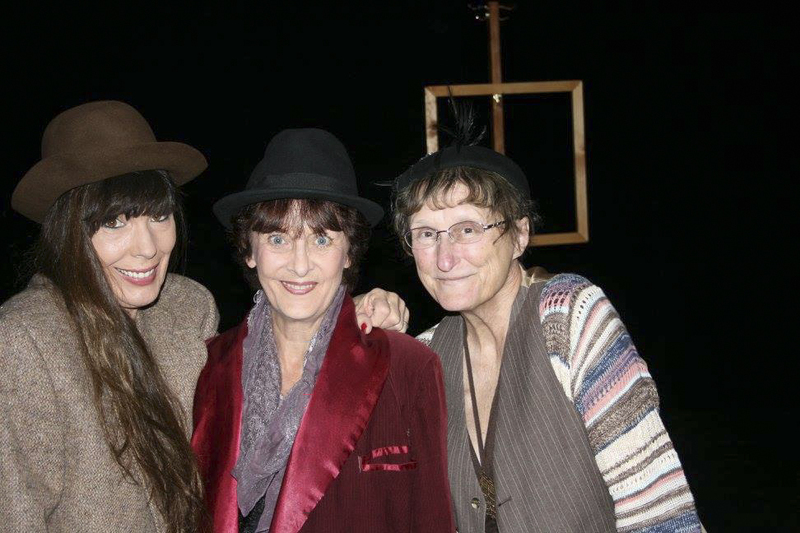 During the intermission we were invited up to try on costumes, so of course the three wild women could not resist. Here we are hamming it up on stage. Thanks to Margaret for the photo! Afterwards, we went to California Pizza Kitchen for a fun dinner. The day was so fabulous! I have not been out since August and just enjoyed the heck out of it, even though very tired today. 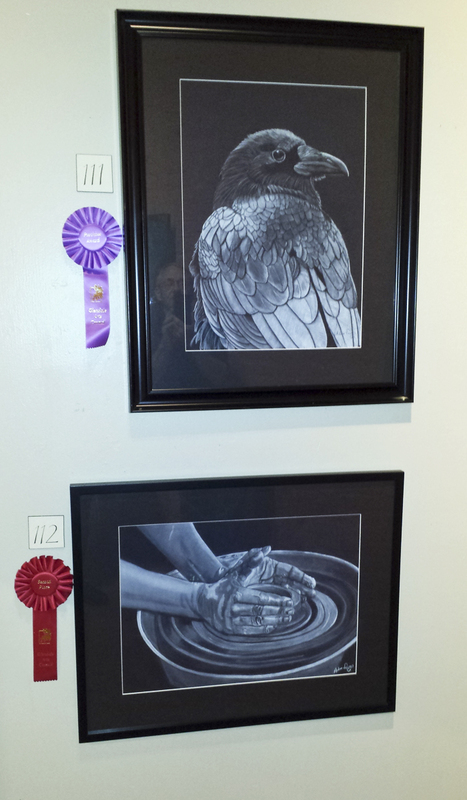 As promised, here is a photo of the two drawings in the Glendale Arts Council – sans ribbons. The purchase Award and the second place are both firsts for me at this show. Very exciting! With all of the fabulous stuff happening this week, I am bursting with happiness! Take that cancer! POW POW!!! Also as expected, here is a photo of the new pastel pencil artwork. 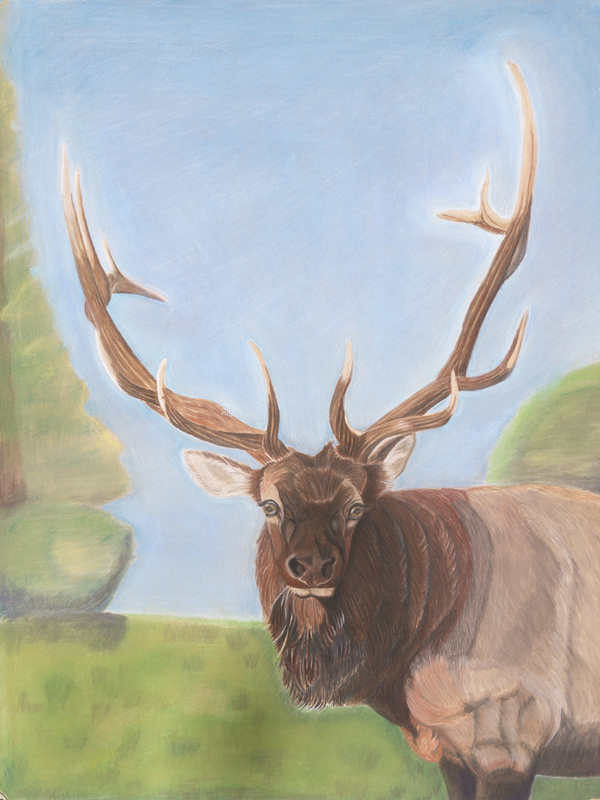 The photo reference is from a trip we took to Estes Park. This guy is so magnificent, I have been wanting to draw him for a long time. Since I have been playing with pastel pencils, I ordered some Strathmore Charcoal paper, and it is holding the pastel. But still can’t wait to get my Ingres Pastel Paper to try. 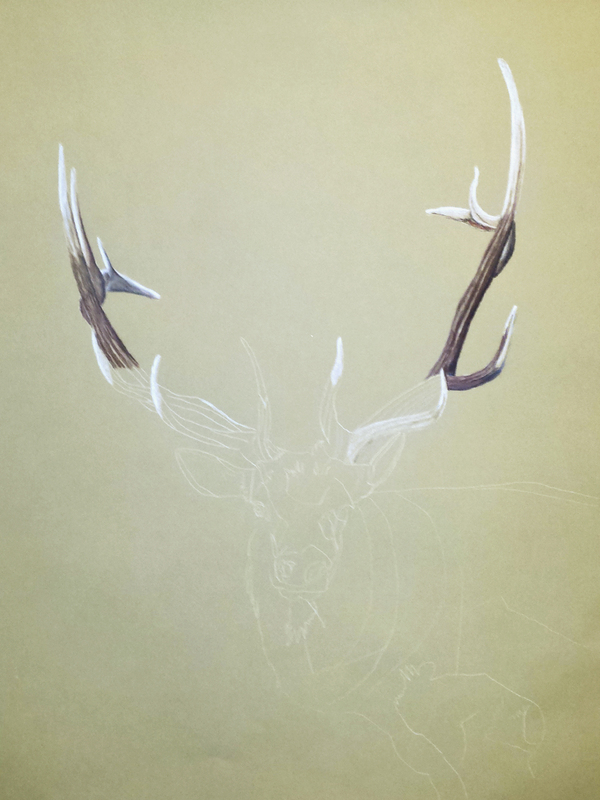 Pastel pencils are working well at showing texture, and may become one of my favorite mediums! SO I haven’t been able to get out to the art store for my famous art supply shopping, but I have discovered online shopping! Who Knew?!?!?? I can bankrupt us from home purchasing art supplies! Do your worst at chewing up my pencils parrots, I am armed and dangerous, LOL. Stay tuned…..a very special blog is coming with guest blogger, Laney Rickman from Bird Endowment!!! !